At the beginning of last week, I launched GreedAndFearIndex - a SaaS platform that automatically reads thousands of financial news articles daily to deduce what companies are in the news and whether financial sentiment is positive or negative. However, the human brain is also severely limited: it is slow, it’s immediate memory is small, we can famously only keep track of 7 (+-) things at any one time unless we put considerable effort into it. We are awash in amounts of data, information and noise that our brain is evolutionary not yet adapted to deal with. Miles Lightwood, of TeamTeamUSA, is leading Project Shelter as Makerbot's artist in residence. Where does 3D printing and species protection intersect? Hermit crabs, apparently. Makerbot Industries, who make do-it-yourself 3D printers, launched Project Shellter last Tuesday. Project Shellter intends to leverage the Makerbot community's design talent and network of 5,000 3D printers to design and produce shells for hermit crabs who face a species threatening, man-made housing shortage. Hmm, sounds familiar. Hermit crabs don’t make their own shells. They scavenge their homes. And now, hermit crabs are facing a housing shortage as the worldwide shell supply is decreasing. With a shell shortage, hermit crabs around the world are being forced to stick their butts into bottles, shotgun shells, and anything else they can find. This is not acceptable. As a community, we can reach out to this vulnerable species and offer our digital design skills and 3D printing capabilities and give hermit crabs another option: 3D printed shells. One of the challenges is that no one knows yet if hermit crabs will live in man-made plastic shells. And if they will, what shell designs would make the best hermit crab homes. 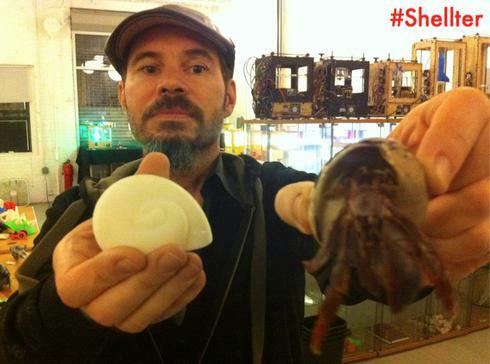 Makerbot is setting up a hermit crab habitat in their factory to test shell designs shared by the community. This is an ingenious crowdsourced intervention, and I encourage you to check it out (follow the #SHELLTER tag Twitter). But, a thought - how about we stop destroying hermit crab homes in the first place? Isn't putting too much plastic stuff in the ocean part of the problem?